July 29, 2018 By Sabrina Quairoli This post may contain affiliate links. Read more on my Cookies and Policies Page located in the menu above. Do not start a new task until the previous step is completed. Make lists to take all those pebbles out of your mind. If you pick number 2, there are checklists to reduce stress in your life and help you to focus and complete the tasks at hand without too much stress. I have used these lists at various times in my life. I hope they help you too. 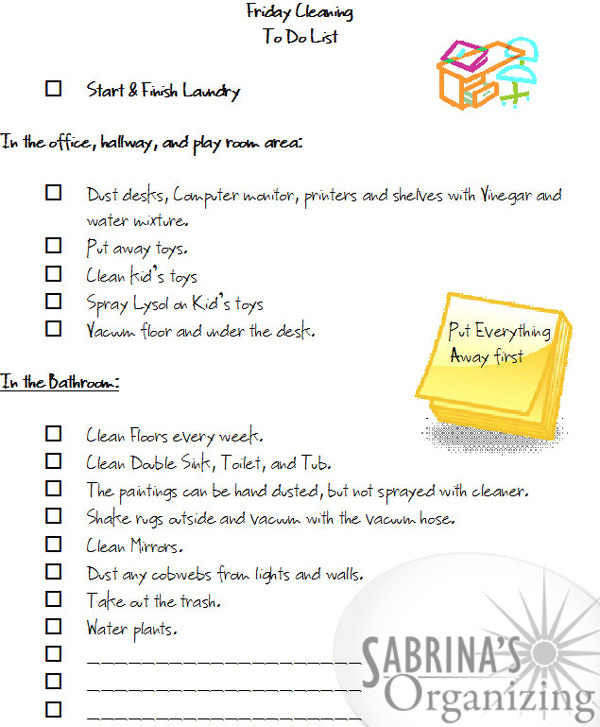 Cleaning the house to do list: Having a checklist for each room helps make it a no-brainer when you are cleaning. It helps you stay consistent with your cleaning routine. Below is an example of a checklist for a particular Friday. You can have a checklist for each day if you want to split your cleaning duties up throughout the weekday. Spring cleaning to do list: Each spring we do some spring cleaning, but we may forget some if we don’t have a list. Below is an example of the spring cleaning list. Cleaning complex appliances: Some appliances have special cleaning requirements. For example, water softeners have a particular solution you need to do each season or at least every six months. The grill has special cleaning, so you don’t add flammable ingredients to the grill. Here’s an example of my grilling season checklist. Visit the post here. Fall cleanout and Winterizing the home checklist: As we clean up the winter grime in the spring, we also need to prepare for the winter. Here’s an example of a winterized checklist. Long-term financial goals list: divide this list into five year and ten year and 20-year sections. It is good to update this whenever life happens or once a year. Some long-term goals could be retirement planning, debt reduction, creating an emergency fund, buying a home, buying a second home, buying a car, and paying for college. Short-term financial goals list: this list is for goals that are less than a year old. It could be paying off some smaller debt or saving for a vacation for later this year. If you want to organize your billing area, you can also check out my What to Keep in Your Billing Station Checklist. Goals list for the year to improve yourself personally and professionally: I find that adding goals to this list helps you focus on the big picture of life and how you want to be as a person. You can divide this list into categories like taking care of yourself, spending time with family, physical health, and mental health. You can also include work organization, productivity, and professional relationship building goals. Preparing for sale checklist: If you are selling your home, this one is for you. What to improve the home for a move checklist Selling your home is stressful. So, writing everything down on a list to get your home ready for sale works nicely. Planning for a party checklist: Some parties are super easy to set up others take some planning. Graduation, landmark birthday parties, and small weddings are just some examples of these type of parties. The items you need to buy for a party checklist contains several pages to help you organize a large party. Invitee list for a party and other events list: Keeping a list with the frequently invited list of friends and family works great. It also gives you a list for your holiday greeting cards if you send them. What to do in your home list: this list could contain tasks for your existing home. You can get the complete list here. Research lists: This would be for items that need a little more research. You can create a bookmark on your browser to help yourself manage the researching items. Packing lists for vacation: This will help you manage your what to take on vacation stuff. If you are going on a cruise, visit this list. If you are looking to go to the shore, this checklist would work for you. It’s a pretty complete list of lists, right? Lol I know it sounds like overkill having all these lists. But, you usually don’t do these tasks on a regular basis. So, instead of thinking what do I need to do or completely forgetting what to do, you can refer to your list. We are adults that need to remember a lot of stuff. Why make yourself crazy remembering every task? Let’s take it easy instead and do. Where should I store these lists? I found that using a digital app allows you to pull it quickly and update it immediately. Look for an app that has lots of space for making lists work great. I am a fan of Evernote and Microsoft OneNote, but there are plenty of other list apps out there. Be sure you can create different lists in the app. How should I start making a list? There are two options I found useful in keeping lists updated. app, create a tab called checklists. Then, create a page for each list you want to make using the to-dos checkbox tag. You can also assign priorities for each of the tasks as well in the tag section. They have options like Important which is a star, To do priority 1, and to do priority 2.
and add it to the specific space under the list title. Don’t forget to remove already completed tasks! This board will be your visual reminder of what you need to do. You can use these lists in different areas of your home. You could display the financial goals list in the home office for example. As a grown-up, you need to make time for all of your responsibilities. That includes taking care of yourself, your family, and being responsible for your actions and decisions. Create the list that works best for you, and that makes you feel empowered to continue and complete your tasks. I hope this inspires you to make lists to organize your life. Let’s continue the conversation. What lists do you make often? Do you reuse your lists? Please leave a comment below. I would love to hear from you. Lists are particularly useful when you are learning a new routine or how to tackle a new set of responsibilities. For example, when you move from a rented apartment into a home. I think they are also very helpful when multiple people are involved in the process. By checking off the boxes (physical or digital), everyone immediately knows what has been done and what is still outstanding! I use Evernote to keep track of many of my check lists–I love the fact Evernote offers the option of placing a little checkbox before your text. I have smiled big when checking off items in Evernote! I also use Evernote for all of those ‘don’t-need-to-reinvent-the-wheel’ tasks such as how to clean the washing machine, what I cooked for Thanksgiving the past few years, and packing lists for vacations and the NAPO Conference. Using checklists reduces ‘brain strain and drain.’ Thanks for reminding us to organize with checklists! Checklists are awesome! One of the things I like about Todoist is that you can create a project, add the tasks, and save the whole thing as a template to use again in the future. That’s an impressive list of lists, Sabrina! I like that you said that you don’t need to use all of these lists at once, which could be overwhelming. But instead, you’ve encouraged the use of lists to help make some of those action items easier to tackle…so you don’t have to reinvent the wheel each time. I find that with certain things, lists really help me…like packing for a trip, planning a party, or figuring out a large project. But other things, like the cleaning, laundry or basic household chores I handle on a more relaxed, intuitive basis. Things get done, but they aren’t as regulated. But that’s just me. I know that for others, having lists for the basics really help.